The highest quality grade "General Availability" Struts 2.5.10.1 GA of Struts 2.5.x is released with security fix. 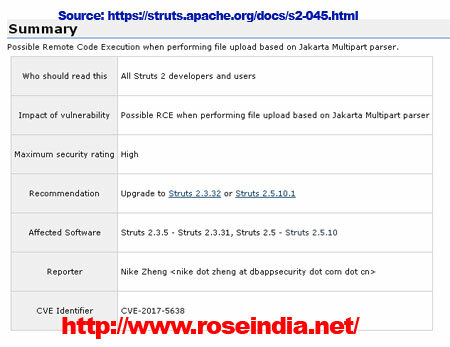 Struts 2.5.x's latest version is released on 7 march 2017 with a security fix and developers are advised to upgrade their production applications to this version of Struts 2.5x framework. The GA (General Availability) version of Struts framework is the highest quality of the software update, developers should use "General Availability" in their production environment. If you are using above versions of Struts framework then immediately update your application to Struts 2.5.10.1 GA. So, developer should use latest version of Struts 2 in their project. Struts 2 is powerful MVC framework in Java which is used in developing the modern Enterprise Java base applications. It offers lots of features which helps developer to build modern applications. The Struts 2 latest version is available from Struts official website and its available in zip format. You can also use the Maven build tool and include its dependency in the project.